The competition centre of Kuopio-Jukola is situated in Rytökylä in the village of Vehmersalmi, Kuopio. 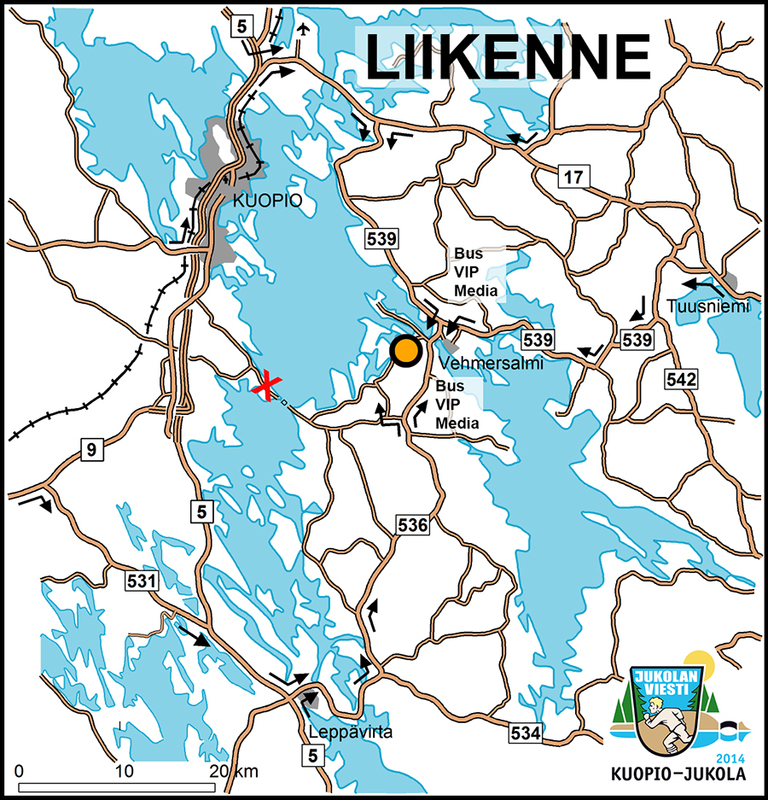 It is 50 km from the centre of Kuopio by car and 22 km by boat. When arriving at Kuopio-Jukola, please follow the traffic instruction signs. When coming from the south or west, don’t take road 5370 from E5 because there is a ferry on the road (see the red cross on the map), causing traffic jams. Please follow the Jukola signs. If you arrive on Saturday, please be prepared to spend at least one hour more on the road because the roads are very narrow and there will be plenty of cars causing queues when approaching Kuopio-Jukola. The parking fee will be checked when leaving. You can pay the fee in the Jukola Shop – please remember to pay it before leaving! The car park is very close to the competition centre. Please remember safety in traffic: start driving home only after having a good rest! It is possible to take a boat from Kuopio harbour to the competition centre in Vehmersalmi. The cruise on beautiful Lake Kallavesi takes almost 90 minutes and costs 15 euros. When the boat arrives at Vehmersalmi, you can take a bus (2 euros) to the competition centre (3 km). There will be bus service from Saturday 10.30 am to Sunday 01.00 am. It is possible to get back to Kuopio by boat or by bus. Further information about the cruises on the websites of the shipping companies. There will be a bus connection (Savon Linja Oy) from Kuopio harbour, railway station, bus station and airport to the competition centre. Costs 10 euros. Satamakatu (next to Kuopio harbour) and Puijonkatu (100m from the railway station and bus station). Please follow the Jukola signs. You can also ask Ms Paula Puustinen (tel. +358 45 630 0270) for transportation, especially if it is needed on Friday. Those arriving by plane in Kuopio should contact info.2014(at)jukola.com in advance so that we know when there is need for bus service from the airport to the competition centre.